Heat gas or charcoal grill. In food processor bowl with metal blade or blender container, combine all mango sauce ingredients except cilantro; process until chunky. Stir in cilantro. Set aside. In small bowl, combine all halibut ingredients except halibut steaks; mix well. Brush some of mixture over fish; reserve remaining mixture. When grill is heated, place fish on gas grill over medium heat or on charcoal grill 4 to 6 inches from medium coals. Cook 5 to 10 minutes or until fish flakes easily with fork, turning once and brushing several times with lime juice mixture. 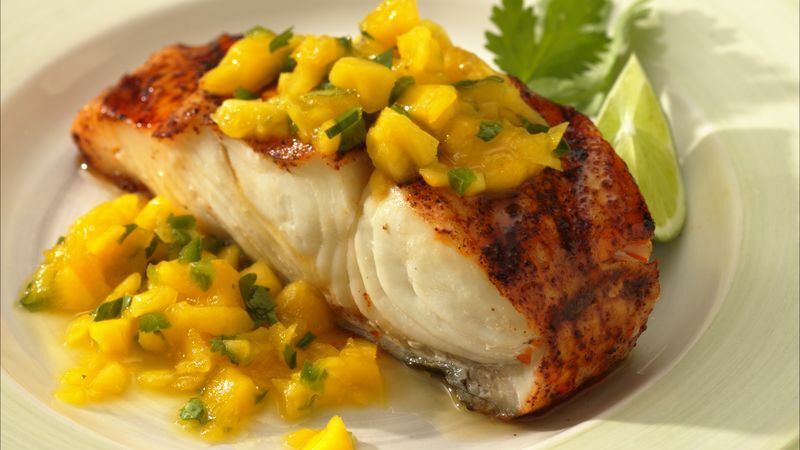 Serve mango sauce with fish.